Nederlands Dans Theater 1 is one of the most thrilling and powerful dance-theater companies anywhere, and this week they are performing in Chapel Hill, as part of Carolina Performing Arts‘ The Rite of Spring at One Hundred series. On April 3, NDT presented CHAMBER, NDT choreographer Medhi Walerski’s and composer Joby Talbot’s intense examination and remaking of The Rite of Spring. CPA was one of several co-commissioners of the work, which received its US premiere in Memorial Hall, where it was the centerpiece of a mind-blowing 3-dance program. NDT will return Friday, April 5, with a different program (see below). An instant in CHAMBER, a CPA co-commission that received its US premiere April 3. Photo: Rahi Rezvani. Chamber is the freshest, least labored, reconsideration of the influential Rite that we have seen during this saturation season…. Although the score (30 minutes total) is marked Allegro insistente/Adagio minaccioso/Scherzando con malizia/Adagio risoluto—allegro brutale, the work as a whole feels less violent than Stravinsky’s Rite. Talbot’s Chamber Symphony is certainly explosive, and rises again and again to overwhelming pitches of sound and emotion, but it lacks the martial qualities that make The Rite so terrifying. The raw power of Chamber is more purely sexual. As in almost every dance version of The Rite, the stage is filled with a large number of dancers in continual intense motion, but in this dance, the interplay between individual and community makes this work distinctively 21st century. Walerski quotes Nijinsky at times, both directly and obliquely, but the balance of power between group and individual is quite different in Walerski’s choreography…This shift to the dancers choosing, rather than being chosen, is key to the music and the motion, and places Chamber squarely in the now. The dance contains many motions that I saw as growth, a bursting forth from the seed, and the sounds are sometimes like this, too—something regenerating, genetically altered but of recognizable parentage…. The dancers entered CHAMBER through reversing panels. Jordan Tuinman’s lighting, switching between blue and gold, added to the rhythms. Photo: Rahi Rezvani. 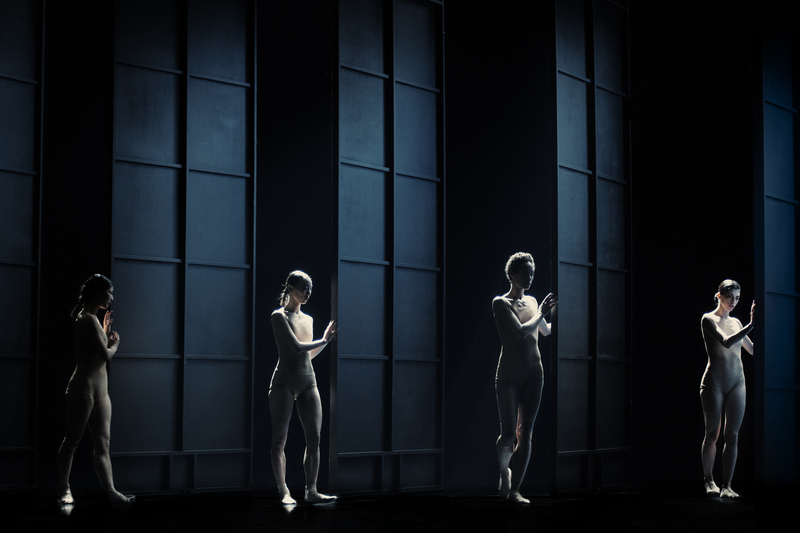 All three works performed on April 3 highlighted the NDT’s profound theatricality, and the brilliant simplicity of their visual designs. The side and back drops in Memoires d’Oubliettes, for instance, are made of tautly stretched elastic cord. What appeared at lights-up to be a curtain was in fact a series of lines, which the entering dancers parted with prayer-paired hands. Warm spots picked them out against the black, and there was something deeply moving about seeing those pairs of hands appear in the same plane but at differing heights, before the heads emerged above them. The piece opens with a flickering screen, like scratchy old movie credits. We see the title, then a series of type animations, where letters drop down to form other words giving clues to the remembered forgotten. When the hands emerge, the verbal, the safely mediated ideas, vanish into the compelling nonverbal world of the dance, in which “safety” does not exist. One of the frightening, breathtaking, moments from MEMOIRES D’OUBLIETTES. 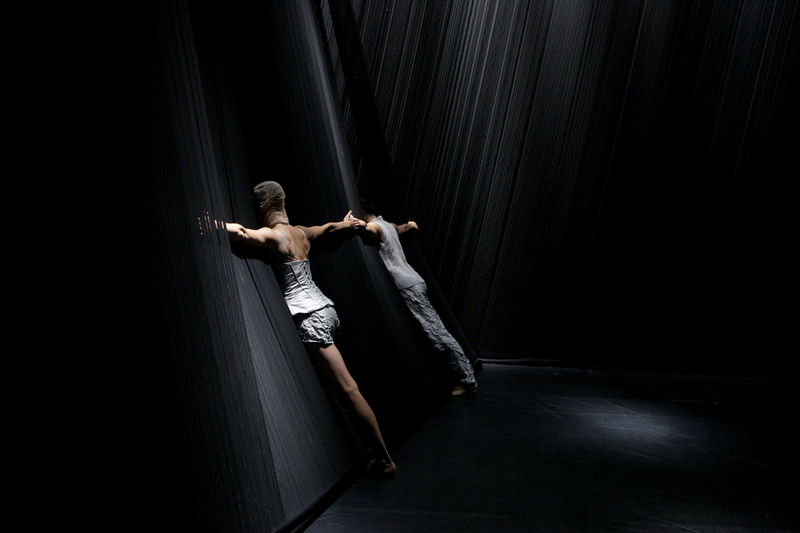 Here, the enclosing elastic “walls” give in response to the dancers’ weight. Photo: Jason Akira Somma. The dramatic beginning of Leon and Lighfoot’s SPEAK FOR YOURSELF. Photo: Rahi Rezvani. The evening’s final dance, Speak for Yourself, had even more expressive lighting than the earlier two, and also pointed up the rather fantastic technical capabilities of Memorial Hall. I mean, not only could they rain aluminum cans from above in Memoires, they rained actual rain onto the stage for Speak for Yourself. The rain blended with smoke rising from an unseen source, and the effect was extremely beautiful, somewhat like torn clouds in a storm over the ocean. When I first saw the photos below, I thought they’d been doctored. But this is what it looked like–the magic of light on water. It looks so free and natural, but to dance in these conditions requires hyper control and balance. Not to mention trust. Dancing in the rain in SPEAK FOR YOURSELF: no slipping, only sliding. Photo: Rahi Rezvani. Such beautiful geometry in their forceful extensions and sinuous curves. Photo: Rahi Rezvani. NDT returns to Memorial Hall on Friday, April 5, with two dances by Sol Leon and Paul Lightfoot, set to Beethoven. Sehnsucht (Yearning) and Schmetterling (Butterfly) examine love, with the help of lighting by Tom Bevoort, who lit Speak for Yourself. Sadly, the company will not reprise Chamber at this time.